I'm now a month and a half out from my surgery. 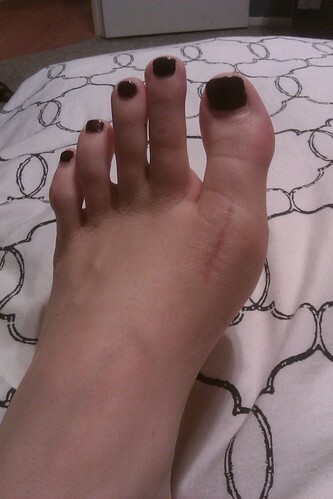 My foot has been doing really well lately and is looking really good if you can get past the giant purple scar I've got now. I still have some soreness and swelling. I keep it elevated when I can and still take ibuprofen every now and then, but I'm able to stand and walk for much longer periods of time now. My Pilates class is going really well and I feel ready to take on more. Last week I sat in on a spinning class and actually did my first 20 minutes of cardio! I didn't last the full class obviously, I didn't do the standing up parts, but it was great to know that I could do it and I did it without pain. I did start to get a little numbness in my foot and that's when I called it quits. It felt great though. I probably won't sit in on a full class, but will hit up the bike on the gym floor. A big difference I think has been switching over to tennis shoes full time. My last Dr. appointment was 3 weeks ago. I don't have to go back unless I feel I need to or something comes up. My Dr. told me I needed to get out of the boot so I could get more movement in my toe. I wasn't excited about it. The few times I tried it it hurt. I went ahead and did it and I'm not going to lie, it kinda sucked the first week or so. Three weeks in tennis shoes though and I feel great. I can move my toe a lot more on my own - before I really had to think about to even get my toe to move and it HURT when I did. Now I can just move my toe up and down with very little pain and not much thought. I think that because I've gotten used to the additional movement, I feel like I can do a lot more. I was going to try Body Flow (a yoga, thai chi and pilates class) on Saturday, but just didn't feel like waking up. I may do it tomorrow morning though or this coming Saturday. So 6 weeks post surgery - ugly scar, still a little pain and swelling on occassion, but otherwise feeling great and getting a lot more movement. That scar is so gansta! Glad you're feeling better and got to spin.